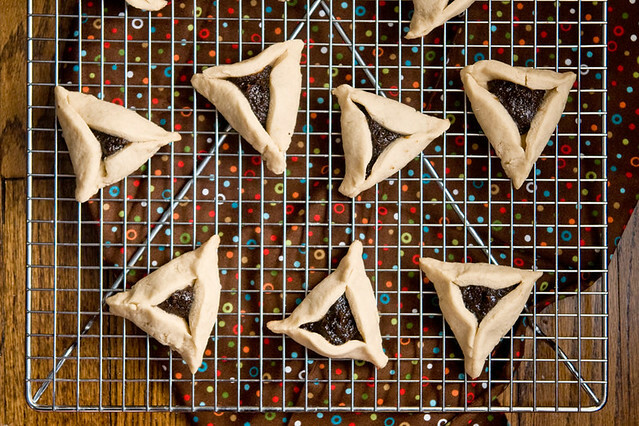 I know, you needed this recipe last week for Purim. But so what? These fabulous cookies can be enjoyed year round! In fact, when I was a teeny tiny Brooklyn girl taking my yellow school bus to yeshiva kindergarten, I didn’t even know that hamantaschen were holiday specific. Oh, what’s that you say…what’s Purim, hamantaschen and yeshiva? Google it! Just kidding (sort of.) In a nutshell, Purim is sort of Jewish Halloween (although, that definition is debated. But I always enjoyed the costume aspect!) 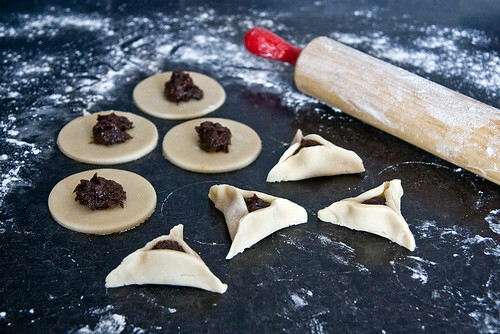 Hamantaschen are fruit filled 3 sided cookies (shaped like a bad guy’s hat. You’ll see when you google it.) They’re fun and yummy and if you share one with any member of the tribe, their eyes will widen and their hearts will swell. There are a few traditional fillings for the cookies. Apricot jam is popular, as is raspberry. But my favorites were always prune or poppyseed. And I have a vague memory of a filling that was both! After doing my own googling, I realized that it might not exist. But whatevs, I invented my own. Sort of a fig newton filling, with crunchy toasty poppyseeds and a few melted chocolate chips and orange for extra depth. The dough is not quite flaky like a pastry dough. It’s crisp on the exterior, but soft and cakier inside. Lemon gives the cookie just a little bit of brightness that is very reminiscent of the Kosher bakeries of my youth. If you grew up with these cookies, I hope they bring you back. And if you’ve never tried them, I hope you’ll become a new fan! ~ For the cookie dough, I used coconut oil for its yummy buttery qualities. Temperature seems to be a really important factor when using coconut oil (it’s solid when cold, liquid when warm), so make sure the oil is at room temperature. ~ I also use warm milk, because cold milk might make the dough too stiff. Warm the milk briefly in a microwave safe bowl or on the stove top. You want it to be slightly warmer than wrist temperature, but not hot. ~ If you’re preparing the dough way in advance and refrigerating, you’ll need to let it thaw for a good long while. The dough gets very stiff when refrigerated, and will need a few hours to get pliable again. In a medium mixing bowl, use an electric hand mixer to beat together the coconut oil and sugar. It should be somewhere between creamy and crumbly. Add the milk and beat until smooth and incorporated. Mix in the zest and vanilla. Add 2 cups of the flour, the cornstarch, baking powder and salt. Beat on medium until smooth. Add the rest of the flour about 1/2 a cup at a time, mixing after each addition, until the dough is stiff, smooth and not tacky. It will probably start climbing up the beaters. That’s ok! Divide dough in two, roll into a ball and flatten a bit into a fat disc, then wrap each in plastic and refrigerate for about 30 minutes. In the meantime prepare the filling. Roughly chop the prunes and place them in a sauce pot. Add the poppyseeds, sugar, orange juice, water and orange zest. Cover and bring to a simmer. Let it cook until the prunes are very soft, stirring often, 5 to 7 minutes. If it seems too stiff, add a little extra water, a tablespoon at a time, until it loosens up a bit. It should be the texture of a thick jam. Transfer to a blender and add the chocolate chips. Puree the mixture while still warm so that the chips melt. If it is too thick to puree, once again, add a little water until it will blend. Once nice and smooth (although many poppyseeds will remain whole) transfer to a bowl and set aside at room temp until ready to form the cookies. Have ready 2 large baking sheets, lined with parchment paper. Sprinkle a clean, dry countertop with a little flour. Take one portion of dough and flatten it out a bit with the palm of your hand, then roll about 1/8 inch thick, sprinkling with flour if the dough seems sticky. 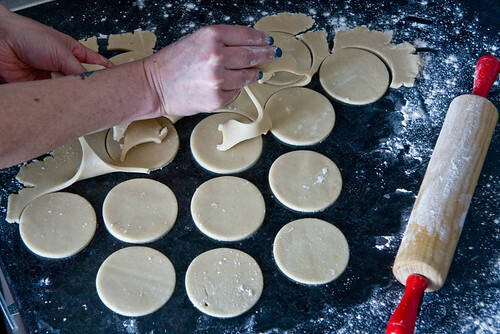 Using a 3 inch cookie cutter, create 14 to 16 circles of dough. Then peel away the excess dough. 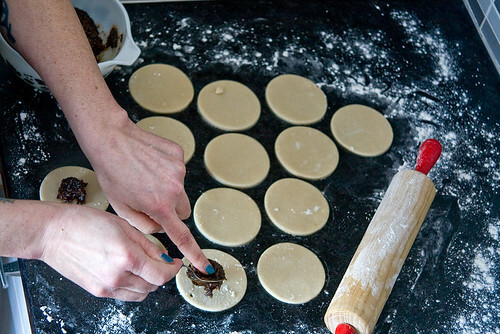 Now fill each cookie with about a teaspoon of filling. Pinch together two sides to form a cone. Then fold up the bottom, once again pinching the sides to seal. Now you’ve got a bunch of Hamantaschen! Preheat oven to 350 F then roll out the other portion of dough and repeat. 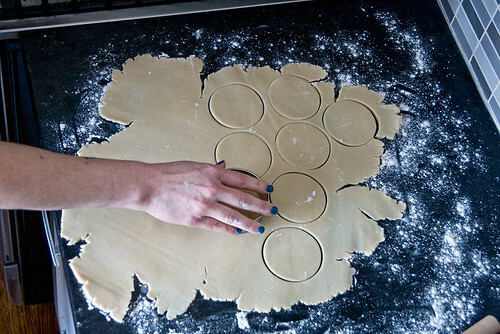 If desired, you can roll out the remaining excess dough and make a few more cookies. I’m always too lazy to do that! Bake cookies for 10 minutes, then rotate pans and bake for another 8 minutes or so. The bottoms should be golden brown. The tops don’t brown much. Transfer to cooling racks to cool completely. Store cookies at room temp in a tightly sealed container. I think they taste even better the next day. Happy Purim! Eating hamentaschen always makes me feel like a little girl. In a good way. And prune and poppyseed are undisputedly the best flavors. As a child I hated poppyseed filling until I made my own, and since then I am addicted. The secret is that once you grind poppyseed the oils will go rancid quickly, which is why I remembered a terrible bitter undertaste. If you grind and immediately make a cooked filling, it will taste like spice from Dune… . My partner and I made samoa and PB&J flavored ones this year! I was deprived as a child, but I have taken back my youth, so don’t worry about me. I love your addition of chocolate chips, but I am seriously mesmerized by the idea of samoa flavored Hamentaschen. Whoa. I will definitely try your recipe! For the filling in my hamantashen, I usually simmer some dried California apricots in water for about 15 minutes and add a little bit of sugar. Then when cool, I puree it in a blender. It is better than any fruit jam, and I love when I have made too much and I get to use it on toast, etc! Thanks for posting this recipe. I love these cookies with apricot filling. In my prevegan days, I discovered them at Whole Foods (of all places) and began to look forward their reappearance every spring. I think they are my favorite cookies! Weird, I also seem to remember a prune poppy seed mixture but my mother says no, two separate fillings. I think it was a result of stuffing one prune and then one poppy seed into my mouth in a gluttonous attempt to kill Hamen by eating his hat. Besides the awesome cookies, Purim was a chance to wear the princess costume from Woolworth one last time. To school. All day long. 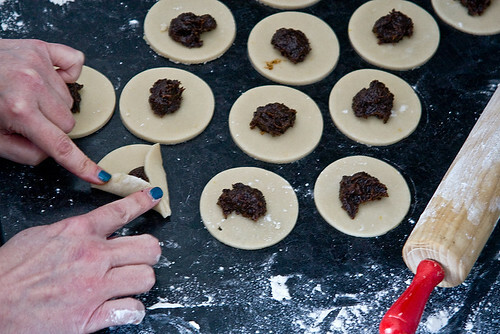 Growing up, I always made hamentaschen with my grandmother. Her recipe was parve (no dairy, for the non-kosher crowd), but had eggs. While the rest of my family, like my grandmother, is not vegan, I am the designated cook of the grandchild generation, so I can’t wait to integrate this in my (not so) evil plot to gradually convert all of our family’s traditional recipes to a vegan version. If only I can make a vegan brisket, I think my work will be complete. Thanks for the education and the tutorial type pictures (for all of us visual learners!) We are reading Night for our homeschool book of the month and incorporating Jewish traditions and holidays as an extension…and for fun. These will be a perfect accompaniment to our studies…and will count as Home Ec…yeah! I’ve never made them and can’t wait to get my hands on some! oh yummy! can i use 2/3 cup veg or canola oil instead of 2/3 cup refined coconut oil??? These were great. I had dried figs and black sesame seeds on hand, so I subbed them for the pruned and poppyseeds. I love you. And that’s so awesome that the vegan chef that I look up to most is as Jewish as I am! I love this site the recipes are amazing. I missed the hamantaschen for this purim but will hopefully remember it for next year! There is a theory that the name comes from “Mohn taschen” which literally means poppyseed pockets, and therefore may have nothing to do with the villain from the Purim story. And as for purim being a “Jewish halloween”, on halloween people dress up and go from door to door collecting candy. On Purim, people dress up and go from door to door delivering parcels of goodies to others (mishloach manot)! To the commenter who wanted a vegan brisket recipe, there is an amazing one in Crescent Dragonwagon’s “Passionate Vegetarian”. 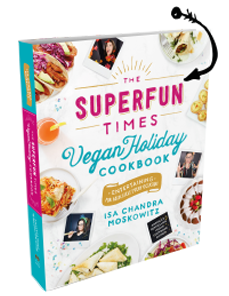 The book itself is not purely vegan (though she gives vegan options for most of her recipes), but her seitan brisket is delicious. I cannot comment on how authentic it is as I have never eaten a real brisket, but my husband loves it and he loves brisket. Thanks for the brisket recommendation! My grandpa is Slovak and we grew up with something that looks similar called rollicky (my grandma always pronounced it “rushkie” so it took me about a decade to find them outside my grandparent’s house). I about cried when I saw them at a Czech stall at the farmer’s market. The shape is different, but the crust and the poppy seed filling looks about the same. I wonder if the recipes share a common ancestor. Oh, I love you. I was in the jewish primary school, and I remember this cakes. Yum. Oh my god, we had also a hadmaster who petedet not speaking polish. And we had distributors with water on every floor. And there was paper cups for it (and for kidush). “Kubeczek” means “a little cup” in polish, and our headmaster was screaming at us “don’t crunching of kubeczki!” xD Loool, poor lady. Cakes with poppyseed filling (or dessert made of poppyseed, fruits, nuts and cooked wheat grains) is traditional xmas food in Poland and other slovian countres, so this can be multicultural and multisesonal 😛 But you made me craving this werid, sticky hamantashen with bounty candy bars. I feel so nostalgic now! 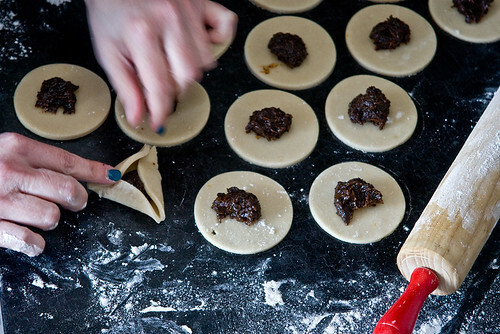 of course i should have looked here firstwhen i neededa vegan hamantaschen recipe. how could i forget my felllow bklynite jewish vegan soul sister! outstanding. this will be today!!! thanks! I made these for the first time two days ago, on Sunday. I got 30 or 32 cookies out of it because I overshot with the filling, and also some may have made its way into my mouth somewhere along the way, but that’s okay, I’m just one person, so 30 or 32 cookies should last me a long time, right? WRONG. They lasted 2-1/2 days. I had 20 in two days. Twenty. I gave 4 to my best friend, who raved over them. And today I ate the rest. I cannot even begin to tell you how YUMENTASCHEN these are. And how much fun I had making them, while wearing a vintage 1950s apron and trilling nonsensical songs to myself in my kitchen, much to the horror of my cat. I am a slender little zipper of a lady, and people have been known to tell me to “eat a sandwich” (which I can’t stand). Never mind the sandwich, people. I’ll take the hamentaschen. Don’t make the mistakes I’ve made. I used sticks of butter-like substance thinking it would be the same as coconut oil. And of course I doubled the recipe, so what I have are a gazillion jam-covered biscuits. I have used this recipe two years in a row and love the taste and texture! One issue I have had both years is that the triangles unfold in the oven. I have tried overlapping them, pinching them, and using less filling, but they still won’t stick. Any suggestions? I just made these and was delighted! I’d never really liked Hamantaschen before, but these have changed my mind on the triangular cookies. The dough was REALLY easy to work with, I didn’t even refrigerate it (not time) and it was still very easy to manipulate even for my 4 year old. These came out great. My only problem was that the sides folded down a little on some of them. Not sure what I could have done differently. And I re-refrigerated the extra after I cut out the circles, then rolled it out (as opposed to throwing it away), but those didn’t hold shape at all and became full circles with jam in the middle. So, next time I’ll just be throwing the scraps away. Made them without vanilla and used dates instead of prunes, but they were great! Thanks! I have used other dough recipes for my Hamantaschen – some with Orange juice and zest – and they all taste good but this one especially reminds me of the wodnerful bakery where I buy them ready made. The coconut oil really enhances the flavor and texture. I only changed the filling as MY favorite is Apricot (which I buy in the cans) and second simply prune (which I buy in jars). Regardless, this is a wonderful recipe that I am enjoying very much. I do make my cookies VERY large as I like a lot of filling in each so rather than a 3 inch cutter I use a 5 inch! I can only say YUM! Can I make this recipe with white whole wheat flour? How would I adjust the quantities? I made this recipe and loved it! However, I did have the same problem as Lauren with the dough unraveling during baking. A few stayed together but the majority opened. I substituted the filling for raspberry jam as that’s my family’s favorite. Thank you! Thanks for posting this amazing recipe!